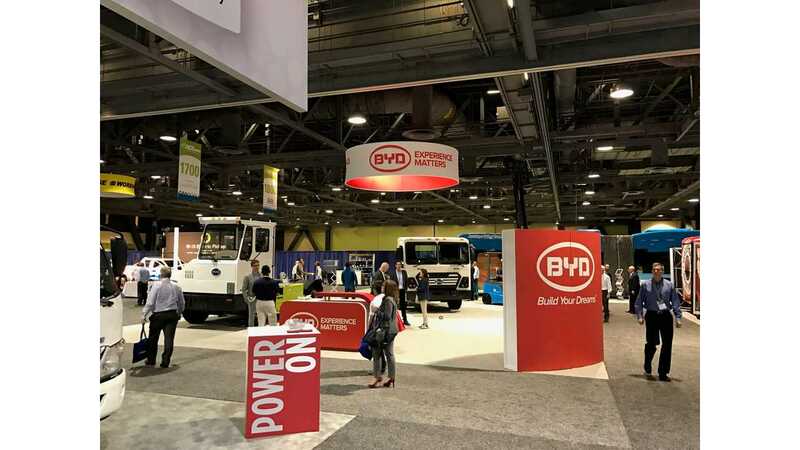 BYD brought a whole set of commercial electric vehicles to the 2017 Advanced Clean Transportation Expo this year in Long Beach; from a terminal tractor, through a 60 ft. articulated bus and a forklift. Now, a new offering from the Chinese company has arrived - a long-range, Class 8, electric garbage truck, with a 10 ton payload. According to the specs on the vehicle, 76 miles of garbage collecting range is possible on a single charge, using a 178 kWh battery. Two electric motors, rated at 201 hp and 550 lbs-ft each, have been tapped to do the work. Charging at 80 kW takes 2.8-hours. 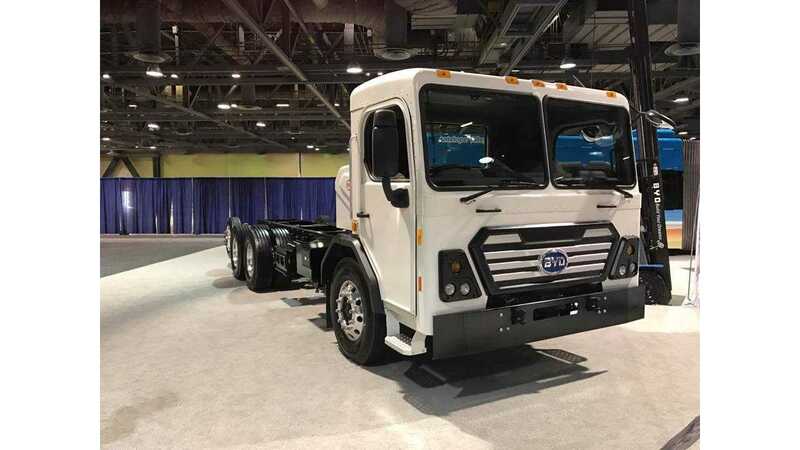 BYD stated that the electric refuse truck could save ~$10,309 on fuel costs, and ~$3,003 on maintenance annually, compared to a conventional diesel version... but don't ask us how BYD managed to estimated the savings with the precision to single dollar. BYD 8Y Battery Electric Terminal Tractor: BYD’s class 8 terminal tractor provides 15 hours of continuous operation and offers operational cost savings of more than $27,000 annually (assuming operations 16 hours a day/seven days a week). 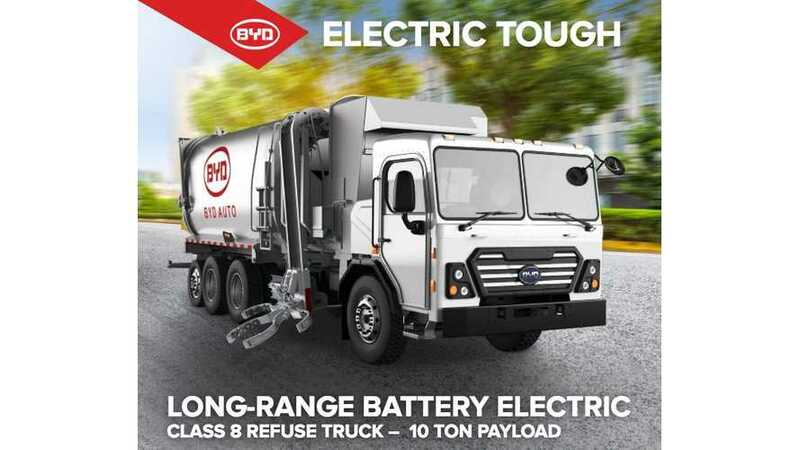 BYD 8R Battery Electric Refuse Truck: BYD’s 10-ton payload refuse truck provides 76 miles of range with minimal battery degradation. Fleet managers can expect more than $13,000 of operational cost savings annually based on service routes of 60 miles per day/five days a week. Manufactured in the City of Lancaster, California, the BYD refuse truck is compliant with FMVSS and CMVSS regulations. BYD K11 60 ft. Articulated Bus: BYD’s 60 ft. battery-electric articulated bus is the latest addition to company’s line up of transit buses is the first of its kind available in the U.S. and provides 200 miles of range on a single charge with full charging completed within two to three hours. The 60 ft. articulated bus joins BYD’s other industry leading 30, 35, and 40 ft. low floor Buy America compliant transit buses with a 275-mile range. 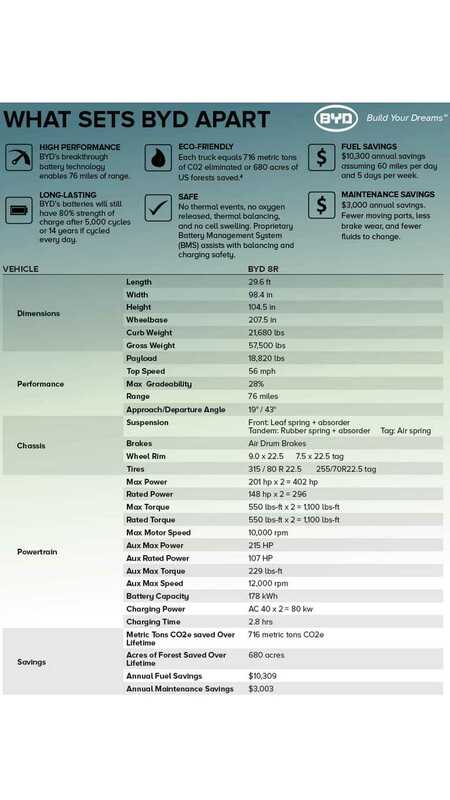 BYD All-Electric ECB 25 Forklift: BYD’s ECB 25 battery-electric forklift provides ultra-fast full-charging completed in one to two hours maximum. The BYD electric forklift can run for two typical shifts on one charge and can be opportunity charged, whenever and wherever. The electric forklift also comes with BYD’s industry-leading 10-year full replacement battery warranty.